Now, words have fallen out of usage at every point in history. Language is always changing, and humans keep marching on. Does this trend matter? Actually, yes. An emerging body of research now reveals that the languages we hear and speak also influence our worldviews, memories, perceptions, and behaviors more than scientists once realized. Children who grow up speaking the same words tend to think in similar ways. Our minds don't just shape our words. Our words shape our minds, too. A linguist named Lera Boroditsky once asked an audience of celebrated scholars at Harvard University to close their eyes and point north. Hands shot up around the auditorium like roman candles, aimed in all possible directions. She repeated the experiment at Princeton and Stanford, as well as in Moscow, London, and Beijing. The result was the same — an array of hands aimed at each of the four major directions and every point in between. But when Boroditsky traveled to a community on the western shores of Australia's Cape York, she discovered that children as young as 5 can point north at all times with absolute precision. Why the difference? The answer, as it turns out, is words. Or maybe the answer is walls. So when I'm outside, I almost always know where each compass direction points. 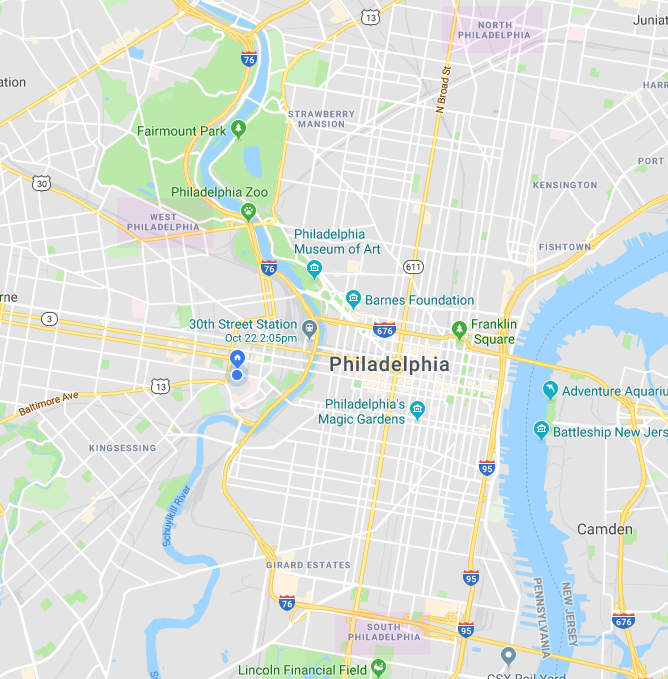 And talk about navigation and directions often involves compass terms — the LDC is on the southwest corner of 36th and Market; the Upper Quad entrance is on the south side of 37th and Spruce; the Schuylkill River is just east of 30th St. Station; and so on. And I think that most other people who have lived in this part of Philadelphia for a while have the same understanding of outdoor compass talk. But if I'm indoors, in a windowless classroom like the one where I teach this semester every Monday and Wednesday, I know which way is out, but I don't have a clue which way is north. I might be able to figure it out by thinking about the path I follow to the classroom from the building entrance on the north side of Locust St., but it's not easy — I tend to lose the compass-direction thread when imagining myself turning around in the stairwell. I am standing next to a five-year old girl in Pormpuraaw, a small Aboriginal community on the western edge of Cape York in northern Australia. When I ask her to point north, she points precisely and without hesitation. My compass says she is right. Later, back in a lecture hall at Stanford University, I make the same request of an audience of distinguished scholars—winners of science medals and genius prizes. Some of them have come to this very room to hear lectures for more than 40 years. I ask them to close their eyes (so they don’t cheat) and point north. Many refuse; they do not know the answer. Those who do point take a while to think about it and then aim in all possible directions. I have repeated this exercise at Harvard and Princeton and in Moscow, London and Beijing, always with the same results. Each participant was tested in two sittings, each including half of the card sets. The two sittings were conducted with the participant facing in different cardinal directions, generally 180° or 90° apart (whatever was possible in the field context). … it is quite hard to disentangle cause and effect. For instance, it is possible that the Tenejapan and Dutch groups think about space differently because their languages pattern differently; but it is just as possible that the two linguistic–cultural groups developed different spatial-orientational vocabulary to reflect (rather than cause) differences in their spatial reasoning strategies. Li and Gleitman (2002) investigated this second position. They noted that absolute spatial terminology is widely used in many English-speaking communities whose environment is geographically constrained and includes large stable landmarks such as oceans and looming mountains. The absolute terms uptown, downtown, and crosstown (referring to North, South, and East–West) are widely used to describe and navigate in the space of Manhattan Island, Chicagoans regularly make absolute reference to the lake, etc. It is quite possible, then, that the presence or absence of stable landmark information rather than language spoken influences the choice of absolute versus spatial coordinate frameworks. After all, the influence of such landmark information on spatial reasoning has been demonstrated with nonlinguistic (rats; Restle, 1957) and prelinguistic (infants; Acredolo & Evans, 1980) animals. To examine this possibility, Li and Gleitman replicated Brown and Levinson’s rotation task with English speakers, but they manipulated the presence or absence of landmark cues in the testing area. The result, just as for the rats and the infants, was that English-speaking adults respond absolutely in the presence of landmark information (after rotation, they set up the animals going in the same cardinal direction) and relatively when it is withheld (they set up the animals going in the same relative – left or right – direction). You can read about it here: Peggy Li and Lila Gleitman, "Turning the tables: language and spatial reasoning", Cognition 4/2002 — as I recall, all it took to make Americans act like Mayans (who did the experiment in an open-walled building on the side of a mountain) was to do the experiment in a room with one wall painted red. There's a come-back by Levinson et al. ("Returning the tables: language affects spatial reasoning", Cognition 2002), and the discussion has continued — you can make up your own mind. I'm convinced (as Lane Greene put it) that "language nudges thought"; but just as I was skeptical about Merritt's evidence for "the death of sacred speech", I'm also skeptical that it would significantly promote immorality through Whorfian connections to cognition, even if his assertions about word frequency were valid. Update — for some discussion of cases where compass orientation is especially confusing (but it's not clear what terminology would be better), see "A westward loop", 10/6/2004; "Un système où tout se tient, and east is west", 10/6/2004; "Loopy defenses of the shuttle bus sign", 10/7/2004; "The gopher's eye view", 10/10/2004; "Westward on the eastbound shuttle; or, what a long strange trip that would be", 10/11/2004; "Down the gopher poll", 1012/2004. "And one day, I was walking along, and I was just staring at the ground. And all of a sudden, I noticed that there was a new window that had popped up in my mind, and it was like a little bird's-eye view of the landscape that I was walking through, and I was a little red dot that was moving across the landscape. And then when I turned, this little window stayed locked on the landscape, but it turned in my mind's eye. And as soon as I saw that happen, I thought, oh, this makes it so much easier. Now I can stay oriented. And I kind of sheepishly confessed this to someone there. I said, you know, this weird thing happened. I saw this bird's-eye view, and I was this little red dot. And they said, well, of course. How else would you do it?" So by Boroditsky's own testimony, it's not that language shapes the perception of the world. It's that a skill that's necessary for a nomadic people in a landscape without rivers or mountains has shaped the language. I've always had a pretty good sense of direction (although it seems to be fading with age) but it tends to be oriented on local structures and street layouts rather than cardinal directions. So if I am walking or driving around town and find myself going down a street I'm not familiar with, I retain a sense of the alignment of that street with respect to the streets that I do know. It's not the result of conscious effort but an awareness that happens automatically. So if you stopped me on the street and asked me to point north, I wouldn't necessarily be able to give a good response (I would have to align my internal sense of direction with a memory of a large-scale map of the area with north at the top). But if you asked me to point in the direction, say, of the Washington Monument, I could get pretty close, I think. In other words, we have skills that are attuned to our environment. I presume that if you live in a open landscape with few natural features but in which the sun is generally visible, and the stars at night, then it would be easier to retain an internal compass direction for north. And as Bloix says, I don't see how vocabulary has anything to do with this. It's all about visual imagination. I remember a colleague telling an anecdote about a speaker of a language that foregrounds cardinal directions (I think it was Mam in Guatemala): the two of them entered a building that neither had been in before and made multiple turns after which the speaker still referenced doors and hallways as east, south, west, north–accurately, I assume. I must say I find this all very puzzling. Am I the only person on earth who knows that the sun rises in the east and sets in the west? It does this every day, quite reliably. I can follow its progress across the sky and remarkably, at noon, it is always to my south. (If you don't believe me you can try this yourself, with a compass. If you are in the southern hemisphere, it will be to your north.) Because I possess this secret, arcane knowledge, I am always able to tell you which direction is north. It is to my left as I face the rising sun, to my right as I face the setting sun, behind me as I face the noontime sun. I have tried this on numerous occasions and it has never failed me. I believe it would be true even if I were a monolingual speaker of Klingon. Was it language or nonverbal culture that make residents on Cape York know which way north is? Religious Jews west of Israel face east when reciting the statutory prayers because that is, by convention, the direction toward Jerusalem (whether or not it true east), so that if you ask them where (their conventional) east lies, they will know. I wonder, therefore, whether Lera Boroditsky tried to determine whether some element in the nonverbal culture of the Cape Yorkers made them know where north lies. Did she ask them about east, west, and south . It's worth mentioning that Americans are much more tuned to the Cardinal directions then are Europeans. When our daughter in law moved to San Diego from Bavaria, she was astonished when people told her, for example, to drive "North" on a given freeway. Once in Paris I came out of the Metro at the Gare de Montparnasse, and didn't know which way to walk to get to my friend Odile's apartment. I called her up and asked her if she lived North or South of the Gare. She had lived there for eight years, but had absolutely no idea. I then asked her if she lived between Gare de Montparnasse and the Seine, or between the Gare and the péripherique. It took her a while to think about that question, but she finally came up with the answer. She is not stupid; she is simply Parisian. On a related note, back in the 90's I often found myself lost driving around the West of Ireland. After a while, I gave up showing my map to locals when asking for help with directions. It was clear that they had never visualized where they lived from a bird's eye view. For an example of a people who use cardinal points as normal means of reference see Haviland, John B. "Anchoring, iconicity, and orientation in Guugu Yimithirr pointing gestures." Journal of linguistic anthropology 3.1 (1993): 3-45. (Guugu Yimithirr is the language of an aboriginal community in Queensland, Australia.) For example… ”Rather than ask someone to "move back from the table," one might say guwagu-manaayi 'move a bit to the west'. If someone asks, "Where are you going?" one usually replies not simply store-wi '[I'm going] to the store' but, as appropriate, guwa store-wi 'west to the store' or perhaps just, in context, guwaar 'west [to a goal]'. Further to my comment of 12:30 pm. I have known speakers of Yidish who have or had a word for 'east' (מיזרח , in romanization: mizrekh) but knew no word for 'south', 'west', or 'north', a state of affairs clearly brought about by the importance of knowing in which (conventional) direction to face when reciting the statutory prayers. Might the fact that Cape York runs north and south and/or the fact that its northern point is the northernmost point of mainland Australia explain Cape Yorkers' familiarity with north? As I understand it, there are three systems of directions: absolute, self-oriented and object-oriented. English is blessed with terms that use all three. What I think of as "little languages," that is, languages that are spoken by a relatively few people in a single locale, tend to specialize on a local landmark, or on absolute directions if there is no local landmark. If maintaining a sense of absolute direction is a survival skill, and learning it is hard, I can understand that learning and using the other two systems is being discouraged to the extent that the necessary vocabulary isn't in the language. I'm kind of surprised that lots of people get disoriented inside, though. Has nobody heard of looking at a floor plan? Again, I refer you to that bright yellow thing in the sky that appears to give off light and warmth. I am pretty sure Providence is not the only location from which it can be seen. @ Laura Morland. Regarding your daughter-in-law's astonishment. I have the feeling that American traffic signs make people aware of directions only when they are driving. For example, if a driver is on the entry ramp of a highway, there is often a bifurcation into one lane leading to Highway X going north and the other lane leading to Highway X going south (or east and west respectively). That is, cloverleaf highways. In that case, signs before the bifurcation will say X North or X South. Likewise on exit ramps if the ramp bifurcates into, say, X Street north and X Street south. Possibly, German traffic signs do not indicate direction. The proof of the pudding would be this: do those people who tell her to drive north, south, and so on also mention s direction if she asks them how to walk to a certain place? I'll bet dollars to donut that they don't. If so, it's nothing more than the traffic signs that make drivers aware of directions on highways but not in other circumstances. But the sun does NOT rise directly to the east and set directly to the West. Where the sun rises and sets varies with the seasons. And the Sun, for post people, not directly to the south precisely at noon. And the higher the sun is in the sky, the harder to judge, if you don't got your eclipse classes on. Also difficult on cloudy days. It's generally tourists, visitors, and the like who use maps to orient themselves whereas the locals learn how to get from one place to another in other ways. The other day I took the bus to get to a certain large building in the city where I live. I have no idea in which direction or directions the bus travels or where the building lies with respect to the stop (north of it? south of it? etc), but I know where to get off and how to get from the stop to the building. However, I could never explain to someone else how to get there if I did not point out the route on a map. It's like tying your shoelaces. We all know how to do it but try to give someone a verbal explanation of how to tie them — without demonstrating how. Right, it's not precise unless you have an almanac and a protractor. Nevertheless it is quite enough to generally know which was is north in any location which you frequent. The exercise here is not to point north within one degree of the compass direction, but to know within a reasonable approximation which way is north. If your head can be found without a proctoscope, it seems to me you would know that. The perpendicular to the direction the sun moves through the sky is north and south, that is perfectly easy to estimate and that is generally how people orient themselves. @Ralph Hickok. You are of course right, but when Laura Morland's daughter-in-law was told to drive, say, "north," I am sure they meant take Highway X "going north," which refers not necessarily to true north but to "north" as marked on the traffic sign just before the entrance ramp or just before the bifurcation on the entrance ramp. Those are conventional directions, chosen to distinguish the lanes of a highway going in one "direction" from those going in the opposite "direction." A highway may zigzag in all directions but the traffic signs will show one of just the four cardinal points (= a conventional direction) so that drivers don't by mistake go away from their destination rather than toward it. It's interesting that speakers of US English give the cardinal directions in the order North, South, East and West. In Chinese it is East, West, South, North. Also, when giving the values in between (e.g., north-east), the Chinese language does it opposite to the way it is done in English, e.g., east-north for the English north-east, though I'm not sure that anyone has ever claimed that any of this affects how or how well speakers of Chinese know directions. Cervantes: You've convinced me that you're serious. I assume that at night you use the stars, but how do you manage in an unfamiliar place if you're in a windowless room or the sky is overcast? And how would you manage around midday in the tropics? I think what you're bragging about may be your memory for directions. That's a great ability, which I envy (though if I cared about it more I could probably get a little better at it). We all have our strengths and weaknesses. @ Jerry Packard. The example you give of English 'north-east' versus Chinese 'east-north' versus English 'north-east' is one of the many reversible binomials in the world's languages, found either in one language (such as "off and on" and "on and off" in English) or when two or more languages are compared (such as your example). Possibly, the difference you point out is regional (it would be good to know what Japanese, Korean, Vietnamese and other East Asian languages have). Is not the order in English may be pan-European. Sorry for the repetition "English 'north-east' versus Chinese 'east-north' versus English 'north-east' ." An edit button would be useful. This is a little off the point of the post; but I cannot resist responding to your mention a Philadelphia, a city which I love to visit in order to ride my bike. Once I had to give my location to someone on the phone, and I said that I was "headed east on Roosevelt Avenue". The person to whom I was speaking replied "Ah, no. Roosevelt Avenue is US Route 1; it goes north and south." What partly explains my perception on this matter is the fact that, if you are coming east from North Philly on Erie Avenue, as the street crosses under the Kensington Avenue train tracks, it turns officially from eastbound Erie to northbound Torresdale, even though the actual direction of the street doesn't change. So the feeling of going east remains as you continue "north" on Torresdale towards Northeast Philly. I can navigate on my bike just fine when I am riding in that section of town; but I cannot shake the idea that in Northeast Philly, just as in the Who's song "Substitute", "the north side of my town faces east and the east is facing south". Regarding the point of the post, I am sure that you are correct in your assertion that the divining of directions is dependent mostly on being outdoors. But, in Northeast Philly, the actual orientation of Torresdale and Frankford Avenues in that section is northeast-southwest. So, when I leave the hotel in the morning and take one of those streets over to the parts of town where the action is, the location of the sun only reinforces the perception that I am going west rather than the official south. Perhaps you are the only person on earth who knows this. The rest of us have known for at least half a millenium that the apparent daily movement of the sun relative to the earth is due the daily rotation of the earth. In the morning, in the East, it is the earth setting, not the sun rising, that we observe. In the evening, in the West, it is the earth rising, not the sun setting that we observe. Over the long arc of its journey, Interstate Highway I-94 runs essentially East-West, so the signs on the entry ramps offer drivers the choice of either the Easterly direction or the Westerly direction. I always found these signs confusing when driving in Chicago, through which the I-94 runs North-South. The salience of the compass points probably depends HUGELY on local geography. Honolulu, notoriously, is laid out diagonally to the compass grid, and locals (and often even tourists, after a short stay) give directions in terms of toward the mountains, toward the sea, toward Diamond Head, and… I haven't been there in a while and have forgotten the fourth point, but more or less toward Pearl Harbor. It is nothing but confusing to try to use the compass directions. My current city, Seattle, has a very strong compass grid over large areas, and it is useful and important to know the grid-north. Downtown, however, is displaced off this, and usually described as north, south, up and down–north and south being *very* loose approximations here to an actual NW and SE, and up and down being related to the hilly nature of downtown. An English-speaking native of Honolulu is, I will guess, less likely to be able to say which way is north while indoors than an English-speaking native of Seattle; and as an English-speaking native of Anchorage I truly had no clue, and had to learn it when I moved to Seattle. In Berkeley, California, if you take University Avenue towards the bay, you’ll come to what used to be called the Eastshore Freeway. Northbound, it’s signed I–80 East/I–580 West. Yes, I–80 will take you to New Jersey, but right here it runs slightly west of north. This is notorious among road geeks. When it comes to listing the cardinal directions in Chinese, dong-nan-xi-bei (east-south-west-north) feels like everyman's choice nowadays… but this may represent a change from an earlier tendency (?). "It's that a skill that's necessary for a nomadic people in a landscape without rivers or mountains has shaped the language." Whatever the arguments posed through this argument, the people of Pormpuraaw are not nomadic, neither do they live in a landscape without rivers or mountains. Why this sort of stereotype is so often applied to Aboriginal Australians and their lands, I won't comment, but it really should stop. It's worth mentioning that Americans are much more tuned to the Cardinal directions then are Europeans. European here, can confirm. The concept of labeling directions in public transport as "[cardinal direction]-bound" would simply never have occurred to me; over here, the directions are called by the names of the terminal stations, in rare cases supplemented by that of another landmark. Worse: we think of east & west as "left & right on a map", and therefore confuse them just as often (how often that is depends on the individual as elsewhere, of course). No, which is why there is no floor plan – with rare exceptions. Outside the US and China, streets with the same name simply aren't long enough to get subdivided names. Four-digit street numbers, as in 1600 Pennsylvania Avenue NW, are practically unheard of; three-digit ones are uncommon and rarely reach 200. Signs on highway exit ramps indicate destinations (2 or 3 per sign if there isn't just 1), not directions. Just like in public transport. Is not the order in English may be pan-European. It is – and now I wonder how old this situation is! I’ve lived my whole life on the east coast of the US and when I was vacationing in Los Angeles one summer, I had a hard time getting to the beach. We went several times and invariably I would either turn onto the eastbound freeway or fight a strong urge to do so. I just had a fixed idea that the ocean was east of me and something about going west to get to the ocean just felt bizarre on some deep level. Most hotel rooms in Muslim majority countries have directional arrows on the ceilings indicating east. Hence the etymological relationship between 北 "north" and 背 "back". Moss. Look for the moss. There is that, but skills are also closely related to need. To use another language analogy, that moment when you are furious and miraculously find yourself letting forth a fluent stream of idiomatic French, after having struggled with the language for months. "European here, can confirm. The concept of labeling directions in public transport as "[cardinal direction]-bound" would simply never have occurred to me"
This is not true in England. The London Tube has many signs such as 'Bakerloo line Northbound'. The same applies to signs on motorways, at least those that roughly align North-South or East-West, like the M1 or M4. There are also many pairs of villages that have included directions in their names for centuries, like East Challow and West Challow. @pickering – not if you're in Malaysia! (sorry to be snarky – the first time I saw a kiblat was, you guessed it, in Malaysia). Indeed, not if you’re in most of the Muslim world! The only countries for which qibla is east are in North Africa. Ask Google Maps for directions from Ft. Chiswell, Virginia to Wytheville, Virginia, it will tell you, "Turn right to merge onto I-77 N/I-81 S/US-11 S/US-52 N toward Bristol." This is correct: a few miles of a single highway is simultaneously I-77 North, US-52 North, I-81 South, and US-11 South. By the compass the route is due West. @Mary Kuhner: Yes. And the fourth direction in Honolulu is ʻewa, in this case meaning toward the place ʻEwa, with or without the ʻokina to mark the glottal stop. But the the reference points change as you go around the island. On a high volcanic island, a mountain rising from the sea, you can travel toward the mountain, toward the ocean, or toward a point along the coast. That's about it. If you travel so far toward the mountain that you get there and keep going, you'll be traveling toward the ocean again, no problem. I am a person with a poor sense of direction and I'm often lost. So after I first read about Boroditsky's work a while ago, I decided to make an experiment on a small scale – could I become conscious of the cardinal directions in my firm's offices? Let's see- my office window faces west and at my desk I am facing north with the door to the northeast. I am in the kitchen, east of my office and west of reception, facing the coffee maker, on the south wall. I am entering the men's room, facing west, and the paper towel dispenser is south of the sinks. I am walking north toward a meeting in the conference room, which is to the northeast. This was hard to do at first but it becomes easier over time. Still, in a strange building it's not possible if you're trying to do something else (like hold a conversation). But if I were an Australian aborigine, apparently, it would be second nature. Laura Morland: Much of Paris was laid out by Haussman not a grid system but a radial one of connecting stars, allegedly to make life easier for artillery in putting down insurrections. The streets give no clue to the compass directions, and vice versa: Parisians must learn to navigate in other ways. Some of the oldest parts like the area round the Châtelet still have the N/S grid laid out by the Romans. London, of course, was laid out by mediaeval drunks. Hence the terrifying Knowledge, the test cabbies learn to get a taxi license: it takes several years to learn the database. Slightly OT, but let me put in a plug for what3words. This is a clever scheme to map GPS coordinates, which are impossible to memorise, with just three random words, creating a one-metre grid for the entire world. It's easy to memorise or note a handful of locations, and to email or text a new one. Closely related words such as plurals and verb inflections map to radically different locations, so mistakes are self-evident. There are several language versions. These are not translations at all. However,the open sea is only covered by English, which has the fattest dictionary. You can have fun entering random combinations of words to see where you end up. Barcelona is, for the most part, laid out on a grid, using the Mediterranean shoreline as the base, but since the shore is at approximately 45º to the cardinal directions, these are not used. The directions are, instead, given mar for southeast, muntanya for northwest, and the two rivers bordering greater Barcelona — Llobregat and Besós — for southwest and northeast, respectively. Montreal, which uses the St. Lawrence as the base for its grid, does use cardinal directions, but based on what is taken as the overall west-to-east course of the river, not its local flow which is almost south to north, so that "north" really means west-northwest — quite confusing for visitors. In the days before satnav, East Tennessee was a notorious place for getting lost, at least among Appalachian Studies Conference attendees. Not only are the roads poorly marked, but the directions are labeled according to a mental map of the Great Valley running from north (VA) to south (GA), so that north is east, south is west, east is south, and west is north. T and arthur: Wikipedia calls those "wrong-way concurrencies". I'm somewhat surprised that no road geek has started a list of them there, as far as I could tell. Bloix: Take it from me, remembering which way north is in a windowless classroom turns out to be easy if your students do a lab there twice a year in which they measure how much magnetic fields deflect a compass needle. In Austria, those are named for comparative altitude instead: "upper/lower" (all the way to Unteroberndorf ~ "lower upper village") or sometimes "back/front" (Hinterstoder, Mitterstoder, Vorderstoder). @ Chris Button Hence the etymological relationship between 北 "north" and 背 "back". I certainly don't subscribe to his palaeographic interpretation of 南 as "the front of a house". D@mn. Beaten to it. Incidentally, am I the only one who has attended a conference, been told by the host that we will be starting with a roadmap, and then been completely perplexed by the total absence of same ? Jon, I take it you have never been to Vermont. Albany, East Albany, Barnet, East Barnet, West Barnet, Brattleboro, North Brattleboro, Newfane, South Newfane, St Johnsbury, East St Johnsbury, Waterford, Lower Waterford, Wardsboro, Wardsboro Center – ad infinitum. I grew up in southern California in an area with a strong slop upward to the north, and I could see mountains to the north. I went to college nearby and had similar geographical cues. I went to graduate school in Berkeley, s\where the hills are to the east (More or less) and the slope of the ground is up to the east. The geography seemed to me wrong for the direction, but north was still north for me. Once, while I was in college, I visited a friend in Long Beach and came home north out of town in the dark and became confused in the dark, so much so that I stopped to look at the stars. I still have a strong sense of which way north is, and even in indoor settings still feel a sense of where north is. I play duplicate bridge; "north" is where the Director puts it, sometimes to my dismay. 2 There is no place called X. There are two distinct places East X/West X right next to each other; eg East Ham / West Ham. The central parts of my city has fairly regular grid which is not very many degrees off the cardinal directions, but people don't often use those to describe where anything is, or how to get anywhere, typically prefering to say things along the lines of "towards [outlying district]". Am I the only person on earth who knows that the sun rises in the east and sets in the west? Of course not. But as others have said, good luck pointing that out on cloudy days, or at night, or anytime near noon on the 40-odd percent of the planet that lies within the tropical zone. I believe it would be true even if I were a monolingual speaker of Klingon. Perhaps @Cervantes and other Sun-cultists have never been to Seattle or other rain-heavy climates, where there is no such glowing orb in the sky 250+ days of the year. In those places, you orient by entirely different things. Seattle usually has a west-east wind, and you can smell the Sound (not audio, but the Puget). If the clouds aren't too low, you can see Mt Rainier to east or mountains across the Sound to west, and again orient yourself. If you know what road you're on, you can determine if it's on grid or off, and make an educated guess. If you're in the woods, which the Emerald City has rather a lot of in and around what you might think is a "city", you can't see this rumored "daystar", and moss doesn't just grow on the north side of trees, but usually the south side is lighter than the others. I'm pretty much always aware of direction and location in buildings, where I generally can't see the daystar even if it existed, but that's videogame and role-playing game habit of mentally mapping everywhere I go and all exits, I suspect not a common skill. In my days of working outdoors, I could have pointed north on demand with very high accuracy (as well as telling you the phase of the moon); put me in a windowless room in an office block and I'd be far less confident. I'm in the US, and I won't disagree that freeways and major highways have cardinal directions attached to them, which help to navigate by directions while driving, but, at least in any area I've been to, public transit uses its final stop as its "direction" (although subways in Manhattan are labeled "uptown" and "downtown", those are words with local meaning, not just blind substitutes for north and south). This is generally enough when your actually at a stop waiting for the train/bus/whatever, as long as you know whether your destination is along the route to the given destination (and of course if there are express routes that skip stops that will cause problems). If you need to look at a schedule, you do need to figure out which line you need, which way along the line you're going, and where you are along the line. I've only encountered one place where there are shuttle bus loops, the Metropark area in NJ (Metropark is the name of the major train station in the area). There are three loops (numbered 801, 802, and 804) and most of them run in both directions (except 802). However, they are designed mostly for commuters using the train station, and so the loops run one way in the mornings and the other way in the evenings, so they are referred to as "AM" and "PM" loops on the schedules and at stops, which works quite well. The London Underground marks its trains and platforms with the cardinal directions e.g., Picadilly Line- eastbound – Platform 3..
Ham means village (originally perhaps homestead or farm). There are lots and lots of hams – Nottingham, Tottenham, Fullham, etc. East Ham and West Ham is about as basic as you can get, It would be odd to have a place just called Ham. Grinstead means green place. Both Grinsteads are very old and were named independently – both were originally just Grinstead. As they are only about 20 miles apart, apparently they both decided to add the cardinal direction to avoid confusion. There are several places just called Ham, including one in London (in the Borough of Richmond, site of Ham House), and one, the source of much amusement, near Sandwich. In Scotland we have a couple of examples of the 'two independent places' version of East X and West X – East Linton and West Linton, East Kilbride and West Kilbride. I wouldn't have called them 'quite near' – they're in different counties – but I suppose if they were even further apart no one would have seen the need to distinguish them. There's also a Ham-en-Artois, near which Tolkien was stationed in 1916. And Long Island has the famous Hamptons (Hampton meaning "Village Town") – East Hampton, Southampton, Westhampton, Bridgehampton, Hampton Bays, and a bunch of other villages and hamlets, none of them called Hampton. New Jersey has the "Amptons", Eastampton, Westampton, and Southampton (There used to be a Northampton, but it was renamed to Mount Holly). My best guess is that they forgot it was supposed to be "Hampton", because Northampton (the one that no longer exists) was incorporated in 1688, and was the only "Ampton" to exist until 1850. By the way "Hampton" could be translated as "hometown" and is even a cognate to the latter (I believe). Names like Hampton can have two different origins, from Old English ‘ham’ meaning village or estate (cognate with home) or ‘hamm’ meaning water-meadow. Northampton was originally the former, Southampton the latter, and the North/South were added later to distinguish them 96 miles away, but both towns).